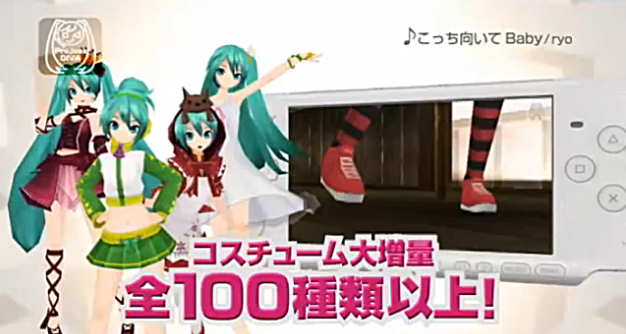 Sega has released two previews to the highly anticipated Project Diva 2nd! They both showcase the songs and costumes! The costumes looks amazing and “Kocchi Muite Baby” is starting to become extremely catchy. The second video is 3:30 of promotional awesomeness. Majority of the songs showcased are the same as the first video but there are a few more songs added to the mix. The end gives a taste of the customization in the game. Didn't they show Sound on the trailer thing already? They’ve released renders of some of the new costumes that weren’t in the trailer. anyone spot Tako Luka!? I saw her twice! HOLY CRAP MELTDOWN!!!!! *dies of awesomeness* I'm so glad I'm learning Japanese! hooray for song specific costumes. I do hope that you can use them in other songs as well. God knows we Luka needs more costume love. Oh and if it the same deal as last time we get to use the costumes from the Op too? I’m so excited for this game I’m considering building a time machine to get to July 29 faster.